This Gospel Book was written on the Continent in the 10th century, but reached England fairly soon thereafter, as shown by textual additions ranging in date from the 10th to the 15th century, which relate to Thorney Abbey, in the Fenlands between Peterborough and Wisbech. The Gospel of Matthew begins with a large initial 'L' of geometrical and foliate ornament, extending the full height and width of the text area. The text of the genealogy of Christ ('Abraham begat Isaac / Isaac begat Jacob / Jacob begat Judas . . .' etc.) 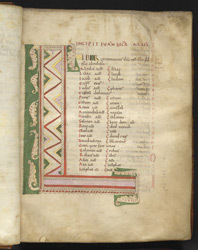 is laid out in two columns, which is the usual arrangement of this section in early medieval gospelbooks. The letters and numbers in the right margin coordinate with the canon tables (index of related passages in the gospels).